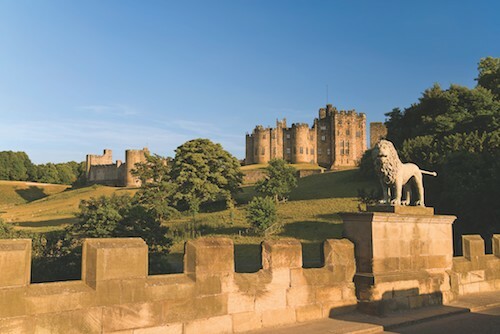 Alnwick Castle in England’s Northumberland, which will take a leading role in a special Christmas episode of “Downton Abbey,” highlights a new 2015 Wayfarers Walking Vacations trip. A new highlight of The Wayfarers Walking Vacations 2015 program is also set to star in a Christmas episode of “Downton Abbey” on PBS’s hugely popular Masterpiece Classic series. Alnwick (pronounced ‘Annick’) Castle in England’s Northumberland, will take a leading role in a special Christmas episode as Brancaster Castle. No stranger to the cameras, Alnwick was also the setting for Harry Potter’s Hogwarts. The cast and crew spent two weeks at the castle last summer, filming extensively in the spectacular State Rooms, as well as in the castle’s grounds and at the semi-ruined Hulne Abbey in the Duke of Northumberland’s parklands in Alnwick. Visitors to Alnwick Castle in 2015 can explore a brand new Downton Abbey exhibition, featuring photography, costumes, and props from the filming. It is rumoured that the episode, which will be screened on Christmas Day in the UK, is likely to air in the US at the end of season 5, which runs from Sunday, January 4 on Masterpiece on PBS. The castle is a centerpiece of The Wayfarers’ new itinerary, ‘Northumbria – Land of Castles, Saints and Vikings’, based on the ancient kingdom of one of Britain’s most remote and beautiful landscapes. It is one of three Walks new to the schedule. The others are in Italy’s Puglia region and a new take on the historic pilgrimage route of the Via Francigena in Tuscany. A Wayfarers’ Downton Abbey vacation already includes a visit inside the ‘real’ Downton, Highclere Castle, in the south of England, other key locations and hiking amid classic English villages and countryside. In festive spirit, the company, which has been providing all-inclusive hiking tours for more than 30 years, is offering ‘a walk in an envelope’ – Gift Certificates which can be redeemed by the recipient for a Wayfarers’ vacation in one of 20 countries across the globe. The vouchers are available for values from $500, up to the full price of a Walk. Founded more than 30 years ago, The Wayfarers Walking Vacations was named by National Geographic Traveler as purveyor of one of the ‘50 Tours of a Lifetime,’ and by National Geographic Adventure as one of the ‘Best Hiking Companies,’ The Wayfarers offers an eco-sensitive walking vacation of both culture and fitness in 19 countries with 40+ itineraries. Walks cover England, Ireland, Wales, Scotland, Northern Ireland, France, Italy, Spain, Croatia, Czech Republic, Germany, Switzerland, Austria, Norway, New Zealand, Patagonia, Alaska, Colorado, Southwest USA, and a barging/walk combination in Burgundy, France. Wayfarers Walks offer exclusive entrees into homes and gardens otherwise closed to the public, graceful accommodations, outstanding cuisine, and meetings with local residents. Walks are from 6-13 days and are rated on a five-level challenge scale. Price per person is all-inclusive from Day One: including all transfers, hotel accommodation, full board plus twice daily snacks, wine with dinner, tips, entrance tickets, maps and postcards. The Wayfarers is a member of Trusted Adventures, www.trustedadventures.com, dedicated to the highest standards of small-group travel and supporting local economies. Facebook The Wayfarers Walking Vacations; Twitter @wayfarers; Instagram Wayfarerswalks.